I stepped out of bed to start my second day in paradise. Instead of landing on two steady feet, my right foot crumpled when it reached the floor. Swollen and red, it seemed twice the size of my left foot. I had a Podiatrist in San Francisco and after treating my broken foot I asked if he knew someone in Hawaii. He didn’t. How do I find a Podiatrist in a city I’ve been in for less than 24 hours? I searched online and found a doctor from California, who went to Stanford and USC and played Water Polo. Purely scientific research, I know. I chose familiarity. Dr. Familiar (AKA Dr. Greg Morris) had an office with a view of the entire downtown Honolulu area and an ocean that spread from left to right for as far as I could see. How could this be bad? It wasn’t. He was great. My foot would survive and I would start physical therapy the next week. I hobbled out of his office to spend the afternoon at the Verizon Store, after my three month old replaced Droid phone broke. Unexpected, and just like real life. 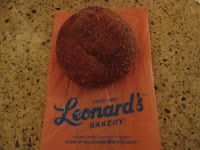 Only in Hawaii. Hawaii. Mark wants to start over and move to Hawaii. It’s not totally out of the blue, he does have family there and he wants to get back into the tourism business. So, we spent February on Oahu, deciding whether to live there or not. Landing at Honolulu Airport as a tourist, I usually rush to get out of the airport, to the hotel and the beach. This time, I knew we were staying for a month; this was not vacation. We were looking to settle on the island. We had a leisurely lunch at the HNL food court and watched the tourists dragging their bags to flights headed back to the mainland. Mark and I rented a car and dropped our bags off at the condo before heading to buy groceries. We were greeted by a large cockroach, belly up and dead in the entryway. All the buildings in Honolulu spray for cockroaches. It’s a problem in the warm, muggy tropical island paradise. No worries. Mr. Roach was disposed of and we drove to Foodland, the neighborhood grocery store. As I entered Foodland, the hot and cold cases greeted me with SPAM musubi, sushi, Korean chicken and various meats breaded, fried and covered in some kind of sauce or gravy. We picked up a tray of fried chicken for dinner with rice. I searched for plastic forks, but only found a holder containing chopsticks. Down a few aisles for my food staples, I came across the SPAM section in the row where I anticipated finding my Bare Naked Granola. 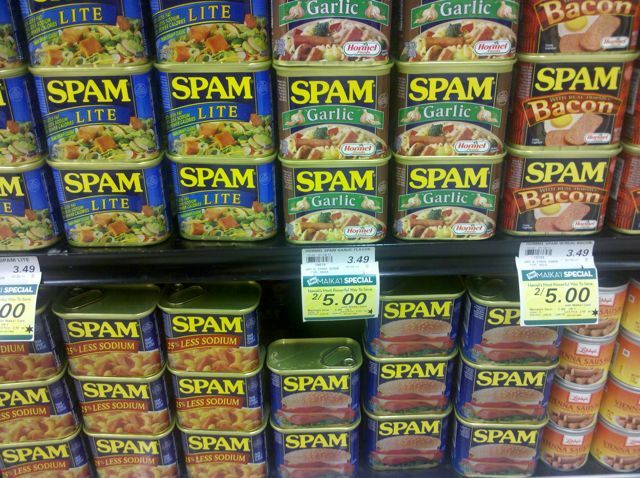 Yes, a SPAM section. In every flavor I never imagined. Where’s the Wallaby organic yogurt, gluten-free section and organic produce? I certainly wasn’t in the Bay Area anymore. Instead of candy and gum and trashy magazines in the checkout area, we were tempted by bamboo plants and leis for sale. I was contemplating returning to California early, when, after dinner, I saw the sun setting into the sky. 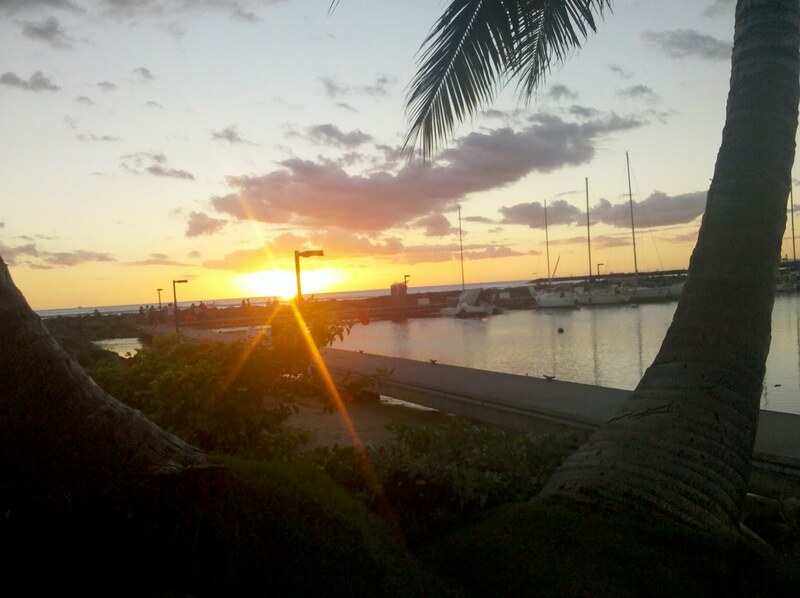 We ran down to the harbor where I snapped this photo of the sunset. I sighed and released all the tension from my back. I would stay. 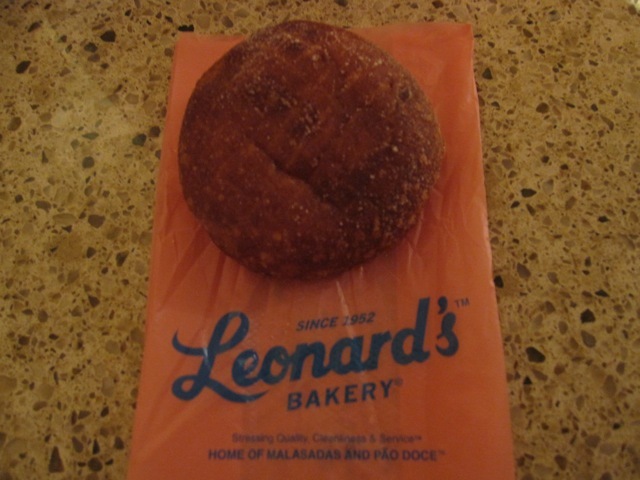 We ended our first day on Oahu at Leonard’s, where I ate my first-ever malasada; a fried, doughy, donut-like ball sprinkled with cinnamon and sugar, that melted in my mouth. Oh, so good. Mark’s Grandma used to take him there as a kid. I was honored he shared with me a place from his childhood memories. By 9pm (11pm California time) I was in bed trying to sleep with air-conditioning whirring in the corner of the room.